What an beautiful and delicious appetizer this is, or it could be a side for a simple meal of grilled fish and green salad. Puff pastry is the easiest dough to work with, as it isn’t finicky like phyllo or pastry dough. I buy it frozen and defrost it on the counter for an hour before rolling. This recipe can be made with sautéed mushrooms and/or caramelized onions in place of the asparagus or sliced tomatoes. In other words, be as creative as you wish. On a floured work surface roll out the pastry dough to a 16 by 9 inch rectangle. Trim the edges and transfer to baking sheet. Score the pastry dough lightly to mark 1 inch from the edges all the way around. Pierce the dough with a fork all over the bottom. Bake until golden about 15 minutes. 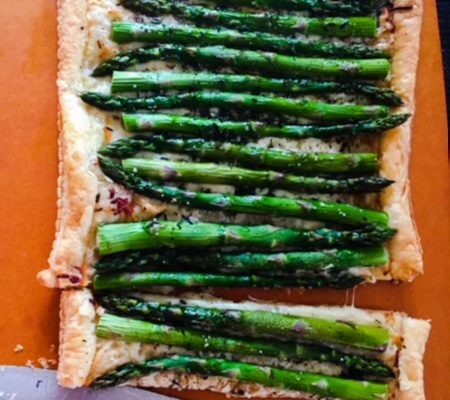 Bake until golden and asparagus is tender about 20 minutes. Cut and serve warm.